In 80% of the cases where children are living with a grandparent, at least one of the child’s parents is also in the household. 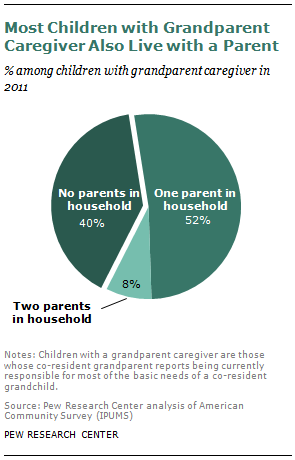 And in more than half of the cases where children are both living with a grandparent and being cared for primarily by that grandparent, at least one of the child’s parents is also present.2 Some 52% of children are living with one parent in addition to a grandparent caregiver, and an additional 8% are living with two parents. Many of the parents in these households have characteristics suggestive of the need for family assistance. For example, 44% had a baby as a teen, and 12% have a disability. One-fifth (21%) are unemployed, 29% lack a high school diploma and 22% are currently enrolled in school. Data used in this report are derived from the 2000 decennial Census, as well as the 2005-2011 American Community Surveys (ACS). These datasets are nationally representative of the U.S. population. The report is divided into three main sections: the first focuses on the characteristics of children living with grandparents, and being cared for primarily by grandparents; the second focuses on the characteristics of those parents whose co-resident child is being cared for primarily by a grandparent; and the third section discusses the characteristics of grandparents who live with their grandchildren, and grandparents who are the primary caregivers for their co-resident grandchildren. Among racial and ethnic groups, black children are the most likely to be cared for primarily by a grandparent—8% are, compared with 4% of Hispanics, 3% of whites, and 2% of Asian children. Among those children being cared for primarily by a grandparent, the plurality (39%) are white, while 26% are black, 25% Hispanic and 3% Asian. About half (51%) of black children being cared for primarily by a grandparent are also living with at least one parent. This share rises to 61% for whites, 66% for Hispanics and 84% for Asians being cared for primarily by a grandparent. Children younger than 6 are more likely than older children to live with or be cared for by a grandparent: 14% of those below age 6 are co-residing with a grandparent, and 6% are being cared for by a grandparent. Among older children, about 9% are living with a grandparent, and 4% are being cared for primarily by a grandparent. Some 7 million grandparents are living with a grandchild—an increase of 22% from 2000, when fewer than 6 million grandparents were living with a grandchild. Among co-resident grandparents, roughly four-in-ten (39%) are also serving as the primary caregiver to a grandchild in the household. Most (55%) of these grandparent caregivers have had this responsibility for three years or more. This is particularly common among black grandparent caregivers—61% have cared for a grandchild for at least three years. One-fifth (22%) of grandparent caregivers are living below the poverty line. This share is just 10% among the full population ages 50 and older. 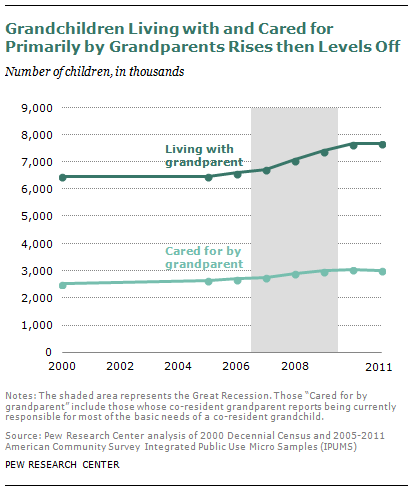 The sharp increase in the number of grandchildren living with their grandparents, and in some cases being cared for by them, during the recession mirrors other trends in family and household structure that have emerged since 2007 as apparent strategies to gird against financial hardship. A recent Pew Research Center analysis identifies recent increases in the share of young adults living in their parents’ homes, due in part to declines in employment, increases in college enrollment and postponement of marriage. Some of these young adults are avoiding moving away from home altogether, and some are “boomerang kids” who have returned to their childhood homes during the economic hard times of recent years. Pew Research has also documented general increases in multi-generational households and declines in fertility that accelerated after the onset of the recession. Other researchers have pointed to increases in cohabitation that have occurred in recent years as well. Post-recession analyses are not yet available for all of these trends, but just as the number of grandchildren living with and being cared for primarily by grandparents leveled off after rising rapidly during the recession, fertility rate declines are also stabilizing, after plummeting. Conversely, the share of young adults living with their parents has continued to grow despite the end of the recession four years ago. This analysis is based upon both the 2000 Decennial Census and the 2005-2011 American Community Surveys, which are conducted annually. Both of these datasets produce nationally representative estimates of the U.S. population. The data were obtained from the Integrated Public Use Microdata database (IPUMS), provided by the University of Minnesota. Further information about the IPUMS is available at www.ipums.org. The report was written by senior researcher Gretchen Livingston. Paul Taylor, executive vice president of the Pew Research Center and director of the Social & Demographic Trends project, and Kim Parker, associate director of the Social & Demographic Trends project, provided editorial guidance. Anna Brown, research assistant, provided formatting and number-checking assistance. Marcia Kramer of Kramer Editing Services copy-edited the report.